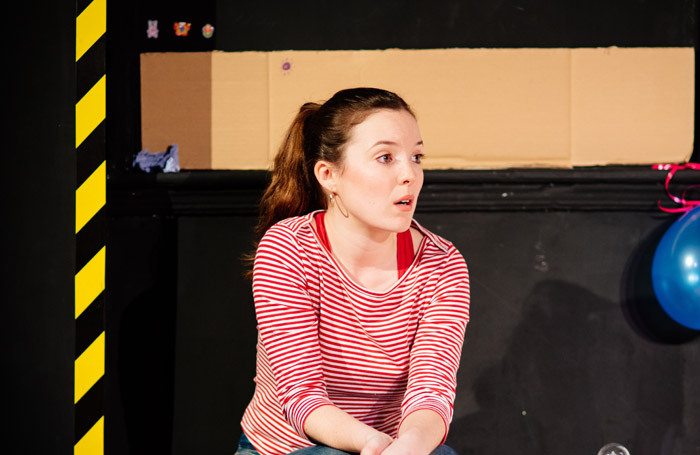 It’s been seven years since Jack Thorne’s one-woman play Bunny premiered in Edinburgh, where it won a Fringe First. Thorne has gone on to pen Harry Potter and the Cursed Child, and adapt Let the Right One In for the stage. His earlier piece is knotty and interesting, a very recognisable portrait of a young woman. Catherine Lamb, whose new company Fabricate Theatre produces, plays Katie, a clever girl trying hard not to use her brain. She’s upper working class, with well-meaning parents who reinforce the value of education, but she’s living in the sort of dismal English town that can stamp out any sense of hope or opportunity. Lamb captures Katie’s easy charm, but the performance feels slightly scattergun at times. She places too much weight on odd moments, dragging the play out, and robbing the ending of its dramatic power. Bunny suffers from the problem so often seen in solo shows: a throw-everything-at-it approach that suggests director Lucy Curtis feared not sustaining the audience’s interest. Balloons burst, there are bears and clouds and furniture gets pushed about with Lamb shifting continually from one side of the room to the other. But all the movement and action feels like a distraction, especially when the writing’s good enough to sustain your interest. Thorne’s play is particularly strong on the garbling nervous-energy horror that is existing as a teenage girl. But while Curtis’ production contains some gorgeous moments – there’s a House of Pain section that’s golden – it feels tonally uneven and over-full.